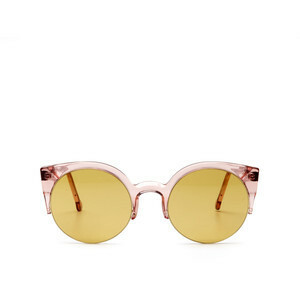 Retro Super Future brings you the petit and thinly framed Lucia sunnies. These sunglasses are a strong, modern design and feature a pink, clear plastic half-frame shape that will characterize you in a fashion realm of your own! Lightweight, simple, and ultra-hip, these sunglasses were created for the a funky fashionista just like you! Try them here, with ViewTry!